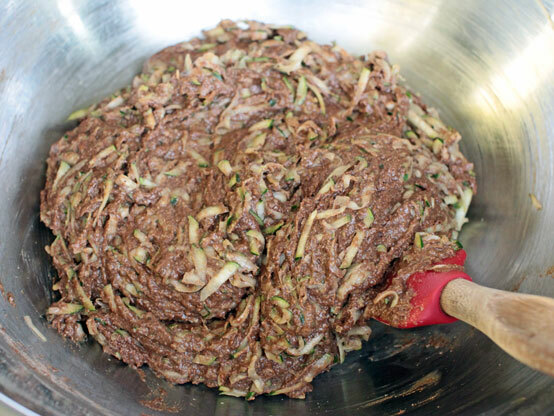 You’ve surely heard of zucchini bread, and you may also be familiar with the concept of chocolate zucchini bread. If not, it may sound strange, but I assure you: chocolate and zucchini go together surprisingly well! 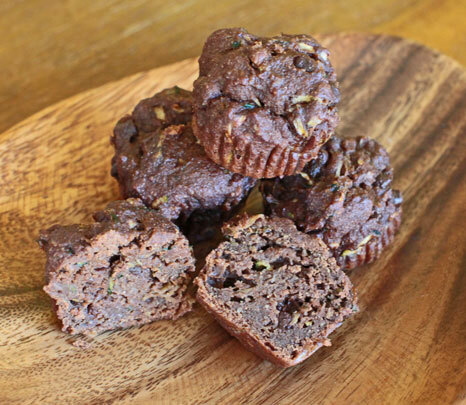 This recipe takes that idea one step further to make chocolate zucchini brownies. These bite-sized gems are perfect when you’re craving something sweet, but not over the top with sugar. They go down in two bites and take a little bonus nutrition with them, being packed with veggies. 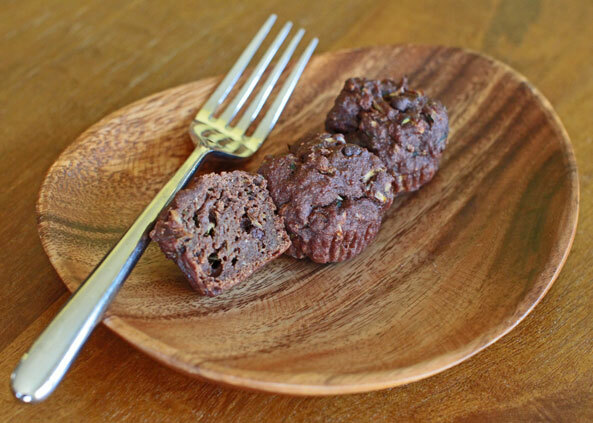 The texture of these could be described as a cross between brownies and mini-muffins. If you’re looking for ooey-gooey, sticky, fudgy brownies, this may not be the recipe you’re looking for. But the idea is to get a little chocolate fix, without wrecking your health. Happily, the ingredient list is devoid of oil. The richness comes instead from some coconut milk, almond flour and cocoa powder. More importantly, the recipe calls for only 2 Tablespoons of unrefined sugar and 4 Tablespoons of maple syrup. For a whole batch of brownies, that’s amazingly little. Throwing in some mini chocolate chips, as I have done, will sweeten the deal, but that’s optional and you get to control how much. So to conclude, I think these qualify as a guilt-free pick-me-up, for dessert or an afternoon snack. You could even munch a few for breakfast. Scandalous! Hey, you won’t get any judgment from me, just a sideways glance and a conspiratorial wink. But is it still as fun to break the rules when the transgression is so slight? There’s only one way to find out. 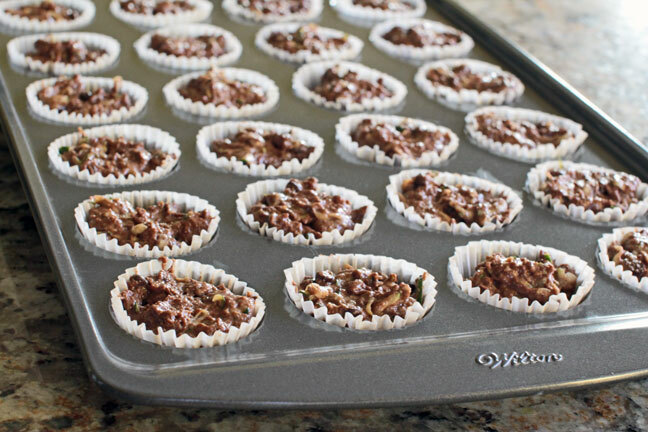 Preheat the oven to 350° F and either grease the 24 wells of a mini muffin pan or drop parchment liners into each one. 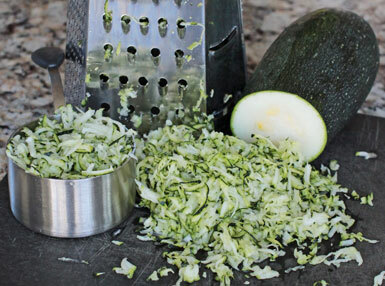 Using a manual grater or food processor, grate a zucchini until you’ve got 2 full cups. 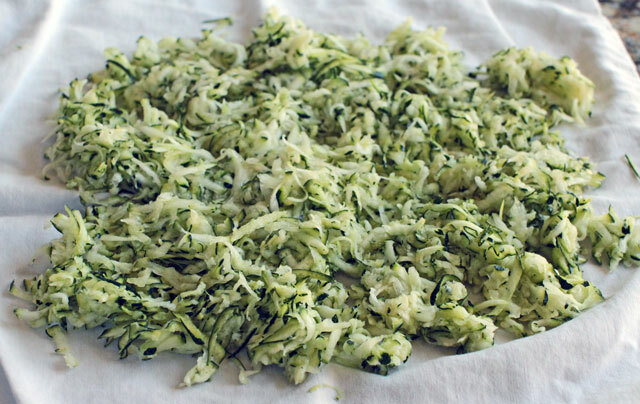 Spread the shredded zucchini onto a clean kitchen towel. Wrap it up and give it a gentle squeeze to remove some of the water. You don’t want it to be bone dry because you need some of the water to make your brownies moist, but you don’t want the batter to be too wet, either. In a small bowl, combine the chia meal (or flax meal) and water. Whisk it with a fork until blended and then set it aside to allow it to congeal. This is what “binds” the recipe, or in other words, what holds all the ingredients together. In a large bowl, combine the sprouted whole wheat flour, oat flour, almond flour, cocoa powder, whole cane sugar, baking powder, sea salt and cinnamon. Stir them together until thoroughly mixed. Make a well in the center of the dry ingredients, and add the wet ingredients: coconut milk, chia mixture, maple syrup and vanilla extract. Using a fork, whisk the wet ingredients until they combine with one another, and then slowly incorporate the surrounding dry ingredients. 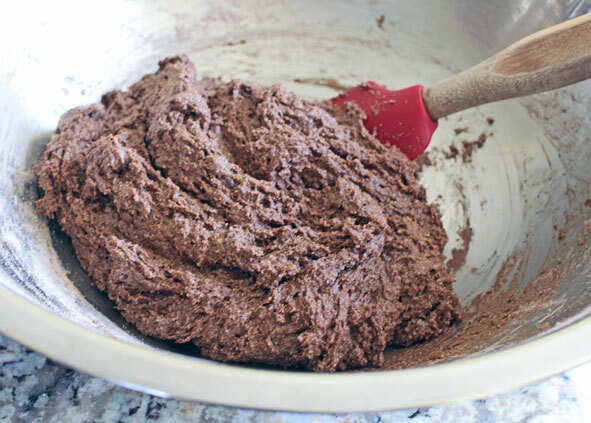 When you’ve finished mixing, the brownie batter will have become very thick, almost like a chocolate mousse consistency. Next, add the drained zucchini. It adds moisture back into the batter, so it becomes wetter and easier to stir after a few strokes of the spoon. Mix until the zucchini is evenly distributed. And then stir in the chocolate chips if you’re using them. Chocolate fiends with a taste for decadence could even increase the amount of chips to a half cup. But ⅓ cup is sweet enough for me. Distribute the batter into the wells of your prepared pan. Slide the pan into the oven and bake for 25 to 30 minutes, or until a toothpick pressed into the middle of one brownie comes out clean. Alternative presentation: I also poured the batter into a loaf pan and baked it at 350° F for about 50 minutes, and it turned out nicely (photo below). 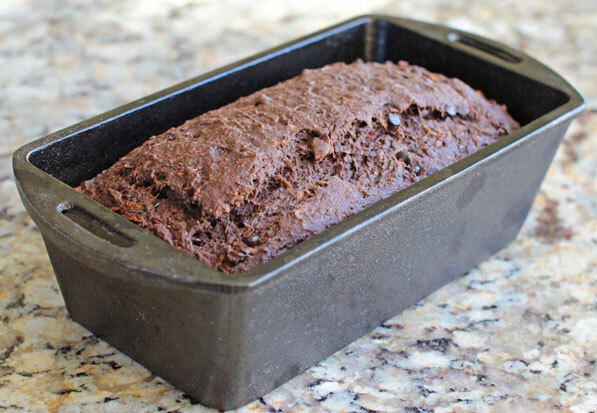 So if you’d rather have a loaf of chocolate zucchini bread, the choice is yours! Either way, this recipe goes wonderfully well with some tea as a mid-afternoon snack, or whenever you’re feeling like dessert. Take two (or three)… They’re small. 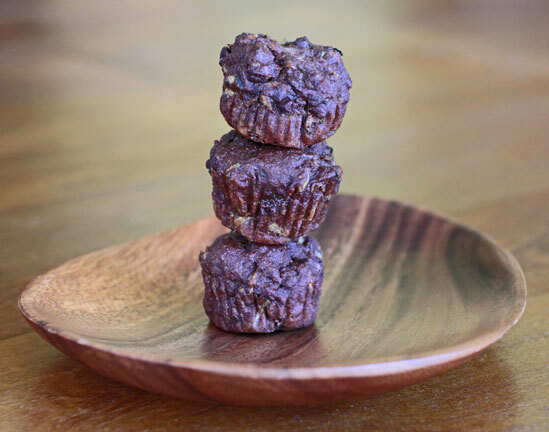 3 Responses to "Healthy Two-Bite Brownies"
Awesome! So much zucchini growing in the garden right now–can’t wait to try this! Stephanie what would be your suggestion for gluten free?